With the evolution of social media, our notion of laughter, entertainment and leisure have changed a lot. Instant messaging has a prominent place in our daily activities now, and WhatsApp has become a daily routine for almost everyone. It is proving to be the best medium to connect with our friends and family. And yes, we have loads of fun with it. So if you are feeling a little bored or if you want to surprise your friends on some upcoming occasion with a mild prank, here is what you can do. There are plenty of apps in the app stores that can create fake WhatsApp chats. Yes, you heard it right! 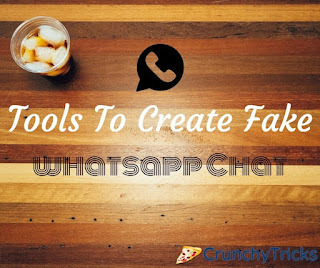 In this post, you can find 10 such cool fake WhatsApp chat simulator tools that deliver fake conversation threads with impressive originality. Fake Call & Chat is a lightweight app that is well suited to prank your friends. You can create a fake WhatsApp chat thread using this. Once the app has been installed, you will have to first create a fake contact. Enter the contact name, an avatar and phone number. Then open the chat thread and enter the message you wish. To get the message sent by the other person, press on the Settings button on the top right corner. Then choose the option Switch to incoming mode. Enter the message in the field that appears and you are done! To make the chat look super original, this app gives other options as well. You can program an incoming message at a particular time. Then you have options to set if the person was Online, Typing, Hide Last Seen or set the Last Seen. 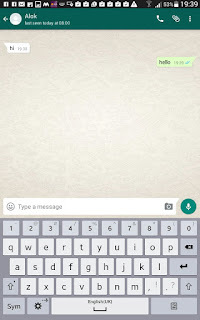 You can put a background image to your fake WhatsApp. Images can be added as attachments or directly from the camera. And if you feel any of the instructions are confusing, there is a Help option right inside the Settings menu that gives you a detailed instruction about all the features in this app. To change the status of the message, just press and hold the message. You’ll find options to set it as Received, Read or Undelivered. You can also delete or change the time of the message. The interface of the app looks as stunning and real as the original WhatsApp. You can also get screenshots of the chat thread screen. And you can change the version of this window too. Prank fake conversations App is quite simple to use. You can add an Avatar, Name and set Last Seen of the recipient. Start typing the message and the details regarding the message can be changed by pressing on the message. One can edit the message, set a time, change the author of the message(sent or received the message) and modify the Read Status. There is an option to delete the message too. 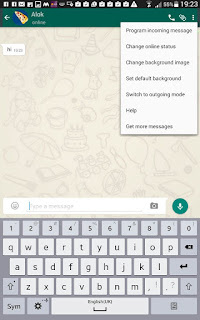 Using the Settings icon, you can set a background image for the WhatsApp screen. Download the app from Google PlayStore. Enter the name of the Contact, Phone Number and type the message. The customization on the message are limited compared to other apps. However, you can use this app to make a quick fake screenshot and prank your friend. And there’s more in store! Fake Chat can create fake Skype, Messenger, Viber or Android message threads too! This app takes up around 5 MB from your phone storage. CHAT & SMS prank is another app that can create fake messages. The interface of this app is similar to Prank SMS & Prank CHAT. You can download this app here. Even in this app, Skype, Viber, and Android fake messages can be created. It has a size of around 6 MB. WhatsFake is a cool app to create fake WhatsApp threads. Create a contact and give the name and set a profile photo. The status can be set as Last Seen, Typing or Online. After filling in the details, click on the tick button at the top right corner of the screen. Start typing the messages in the fake thread that will be created. You can edit or delete the message content by tapping on it. Information such as whether it is a sender or receiver message, time and read status can be customized as you wish. In this app, you can set the version of the WhatsApp. Create a contact name and then click on that thread to keep adding messages. The incoming and outgoing messages can be entered by toggling between incoming and outgoing modes. Also, the background image can be changed to make the chat look more real. The screen that shows all the WhatsApp chat threads can also be created using this app. iOS users! Don’t worry. Although there aren’t too many apps as there are on Android platforms, there are a few fake chat simulator apps that might cheer you up. This is the iOS counterpart of the Prank fake conversations App you’ve just seen above. But it is a bit too space consuming in the iOS device compared to the Android version. This app runs in iOS 7.0 or higher and is compatible with iPads or iPod touch. It is lightweight with just 3.4 MB in size and works with iOS 6.0 or higher. You can change the Sender, the Avatar and also edit the images. The chaos created are pretty much real. WhatsFake is again the iOS version of the Android app. You can change the sender, choose an avatar and also set a time for the messages you create. The read status of the message can also be adjusted. It works with iOS 7.0 or higher and is compatible with other Apple devices such as iPod touch or iPad. And if the Windows users are feeling left out, here is a fake message app that you can entirely run on your Windows phone. You can create fake WhatsApp messages by downloading this app. The screenshots look quite genuine. The app runs on a Windows 8 or higher platform. So make your friends mind blown with your little trick here. But remember, these are only meant for fun and entertainment purposes. Never use it for impersonation or insulting your friends or family.